PolyQuik LV, Low Viscosity, Fast-Setting Two-Component Concrete Floor Small / Hairline Crack Repair & Filler. 300x300 mL cartridge sets (~19 oz net material). Price/Set. 12 Sets/case. Order Full Cases for added discounts. 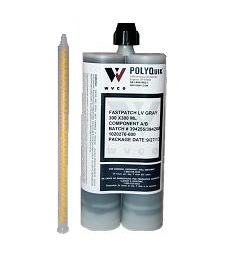 PolyQuik-LV concrete crack repair / filler is a two-component ultra low-viscosity 100% solids polyure which is quick curing. PolyQuik LV is designed to penetrate, fill, heal and repair cracks in concrete floors, sidewalks and such. PolyQuik-LV provides excellent resistance to spalling, abrasion, chemical attack, and corrosion. Product cures to a very hard state which can be ground to hide cracks. It is compatible with most all overcoats (polyurea, polyurethane, epoxy, etc). 1 each Dual 300ml tube set. Shake WELL before opening. Put tube in gun. Hold tube straight UP. Remove plugs. Attach a new mixing tube. Pump to fill mix tube WHILE TUBE is straight up so no air is trapped. Point downward and immediately pump 4-5 inches into a disposable cup then immediately start on the cracks and spalls. Do not STOP pumping for more than a few seconds. Pump continuously until job is complete. Any significant stoppage will cause product to start to cure in mixing tube. Do not use any other kind of mixing tube. FastPatch "NS": Trowelable grade for vertical repairs. Concrete Floor Crack Repair Filler Sand, 4 lb. Crack Floor Crack Repair Filler Sand. Dry white fine silica sand is used with thin viscosity Slab Crack Repair Kits. Fill approximately 100-300' of crack. 4-lb Bag. Price/Bag. No. 9 Euro Nut. Plastic retaining nut for Epoxy and Foam Static Mixers. 9-pitch plastic nut. Could be white or black color. Used for attaching the mixing nozzle to the dual component cartridge. Price/Each.